Painter, born 15 June 1927 in Vilnius, died 23 March 1957 during an excursion in the Tatra Mountains. One of Poland's most outstanding and most independent post-war artists. He created his own individual, highly suggestive, and prolific formula of figurative painting. Andrzej Wróblewski was one of Poland's most outstanding and most independent post-war artists. He created his own individual, highly suggestive, and prolific formula of figurative painting that continued to inspire and became a reference point for several generations of artists who came after him. Between 1945 and 1952 Wróblewski was a student in the Painting and Sculpture Department of the Academy of Fine Arts in Kraków. There he studied under Zygmunt Radnicki, Zbigniew Pronaszko, Hanna Rudzka-Cybisowa and Jerzy Fedkowicz. For a part of this period (1945-48), he simultaneously studied art history at the Jagiellonian University. Initially Wróblewski dabbled in the graphic arts (the artist's mother, Krystyna, was herself a practitioner), creating wood engravings and later sporadically venturing into lithography. Throughout this time, however, painting remained his focus. Wróblewski also donned the hat of art theoretician and critic at times, publishing articles in Głos Plastyków (Artists' Voice), Przegląd Artystyczny (Arts Review), and Życie Literackie (Literary Life). His first paintings were very much Capist in spirit (e.g. Martwa natura z dzbanem / Still Life with Vase, 1946). Early in his career, towards the end of the 1940s, he began to rebel against the dominant Colorist style propagated in academic circles. At the 1. Exhibition of Modern Art (Kraków, 1948), where Wróblewski effectively debuted as a painter, he exhibited some original spatial forms. He remained faithful to painting, a medium he hoped would allow him to transcend mere visualization. It was these hopes - these ambitions to create socially engaged, communicative art - that were the source of his rebellion against Colorism. Rebellion inspired him to act and in 1948 Wróblewski initiated efforts to create the Self-Teaching Club as a unit of the Association of Polish Academic Youth at the Kraków Academy of Fine Arts. Its first members included Przemyslaw Brykalski, Andrzej Strumiłło, and Andrzej Wajda. This was the first group in the history of Polish art to openly manifest against the aesthetics of Colorism. The primary thesis of Wroblewski's program accented the need for art in which "aesthetic and ideological elements would be indivisibly fused." Throughout this time (1947-48) Wróblewski focused on experimentation in his own work (primarily oil paintings and gouaches), searching for unique means of expression, remaining open to the influences of various tendencies (Surrealism, abstract art, geometric art), which also strongly influenced other Kraków artists. His canvasses of this period frequently include geometric figures (Niebo nad gorami / The Sky Over the Mountains, Niebo niebieskie / Blue Sky, both 1948; Segmenty / Segments, 1948-49); several works incorporate the motif of the sphere, lit from inside (Niebo / Sky) or covered in a colorful mosaic (Ziemia / Earth). Another frequent motif is the simplified, somewhat "primitive" figure of a fish, which appears in canvasses with a somewhat surrealistic tone (Zatopione miasto I / Inundated City I), in those that are more lyrical (Ryba/ Fish), and in his more dramatic scenes (Ryby bez głów / Headless Fish). Through exploration Wroblewski devised his own formal language, the source of which was direct and meticulous observation of reality. The artist seems to subject these observations to artistic interpretation, above all striving for a heightened expressiveness, and achieving this mainly by deforming figures and using synthesized, flat planes of intense color that seem to carry metaphorical meaning. His series Rozstrzelania / Executions, dating from the end of the 1940s, provides some good examples of this type of composition. These scenes of events during the German occupation of Poland are exceptional for the intensity of feeling they provoke. The artist accomplishes this by depicting brutally deformed human figures torn into pieces; at the same time the canvasses are maintained in cold, blue-green, cadaver-like hues. Around this period the artist produced other paintings in which he used the symbolism of blue as denoting non-materiality (Syn i zabita matka / Son and Dead Mother, Matka z zabitym synem / Mother and Dead Son, Zabity maz / Dead Husband). In creating the Self-Teaching Club Wroblewski in effect spoke out with conviction in favor of Socialist Realist doctrine. During the next years his paintings would be consciously in line with imposed artistic and ideological tenets (Poczekalnia - biedni i bogaci / The Waiting Room - the Rich and the Poor, 1949; Dworzec na Ziemiach Odzyskanych / A Train Station on the Restituted Territories, 1950; Zlot młodzieży w Berlinie Zachodnim / Youth Convention in West Berlin, 1951; Fajrant w Nowej Hucie / Time Off at Nowa Huta, 1953). He changed both his manner of painting (towards a style more akin to traditional realism) and his palette (making it darker, using more browns and greens, foregoing the symbolism of colors). These works are among the least interesting in the artist's oeuvre. At the same time as they failed to satisfy him, they did not bring him the recognition of the overseers of Socialist Realist doctrine. Wroblewski reverted to his previous interests mid way through the 1950s, creating a series of figurative paintings centering on the subject of the family. Generally positive in mood, they were inspired by the artist's private life (Wróblewski's son Andrzej was born in 1954). Nevertheless, the artist continued mainly to depict the difficulties (Kolejka trwa / The Queue Goes On, 1956) and fundamentally tragic nature of human existence (Garbuska / Hunchback, Pranie / The Laundry, Ukrzeslowiona II / Chaired II, all 1957). Frequently he would deform, almost injure the figures he painted, granting them highly grotesque forms (e.g. Ukrzesłowiona / Chaired, the Nagrobki / Gravestones series, 1957). Apart from his Executions, the gems in Wróblewski's crown include a series of spare, precisely constructed compositions depicting a chauffeur facing away from the viewer, gazing into infinite distance (1949, 1957). In these canvases Wroblewski achieved an unusual emotional tension, this despite their formal austerity and decisive color solutions. In the years preceding his tragic death, the artist once again turned to issues of war and human mortality. 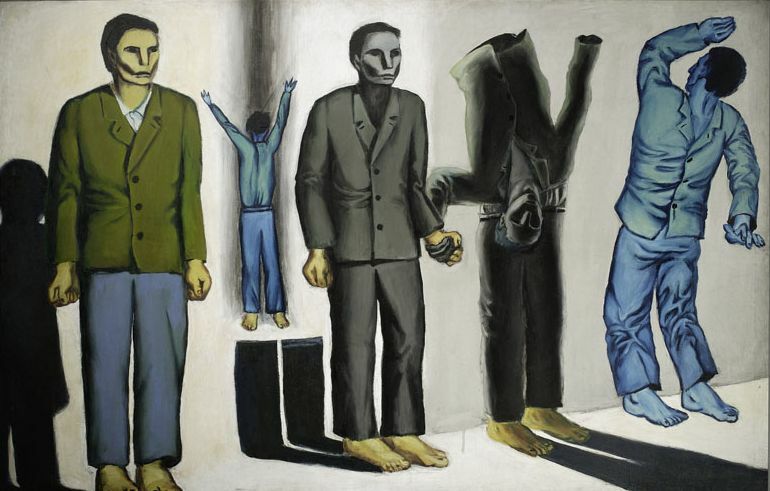 Around this time he created metaphorical works in which he depicted humans as silhouettes, de-individualized forms reduced to being a monochromatic plane, incorporated in the background like a shadow (Cień Hiroszimy / The Shadow of Hiroshima, 1957). Wróblewski died tragically when he was only thirty years old, mountain climbing in the Tatras. Though abundant, his output was far from homogeneous. It includes numerous experiments, sketches, works on a variety of subjects that he approached in innumerable ways. The full scale of his explorations and abilities did not become apparent until the recent (1997) monographic exhibition of the artist's works. This showed clearly that the most exceptional section of Wroblewski's oeuvre consists of the paintings created according to the figurative formula discussed above (created under the influence of artists like Fougeron and the Mexican muralists). Wróblewski clearly had an impact on the appearance of "new figuration" (mainly among artists of the Kraków-based Wprost / Simply group) and the "wild", neo-expressive current of the 1980s (primarily embodied in the work of Jaroslaw Modzelewski of the Warsaw-based group known as Gruppa). An interesting view of these relationships is afforded by the book titled "Andrzej Wróblewski nieznany" / "The Unknown Andrzej Wróblewski" (Kraków, 1993), which includes a range of texts by the painter and reproductions of little known works, as well as statements by contemporary artists about Wróblewski's art. Extensive information about Wróblewski's oeuvre and an abundance of illustrations can also be found in the catalogue to the above-mentioned retrospective of his works held at Warsaw's Zachęta Contemporary Art Gallery in 1997 (the publication itself appeared in 1998). The first foreign individual exhibition of Wróblewski was organised only 50 years after the artist had died – titled To the Margin and Back, it was displayed at the prestigious Van Abbemuseum in Eindhoven, the Netherlands, in 2010. Magdalena Ziółkowska, one of the founders of The Andrzej Wróblewski Foundation, was the exhibition's initiator and curator. In the same year, the big group exhibition A Vision of Central Europe. The Reality of the Lowest Rank, curated by Luc Tuymans, opened in Bruges. Tuymans, one of the most important contemporary artist, apart from including Wróblewski in his exhibition, also consequently promotes his art and owns several of his paintings. Wróblewski and his main topics – war and formal rupture – seems to be a figure hard to translate into another language. However, the tension between abstraction and figuration might be interesting for international audience – similarly to his political engagement and balancing between modernity and socialist realism. Andrzej Wróblewski is our legend and our dream is that he becomes recognisable in the international art world. There is no guarantee we will succeed. It's a fascinating experiment. It's an important opportunity, because Museo Reina Sofia is one of Europe's most crucial museums. One of its aims it's a dynamical rewriting of 20th century history. For non-Poles understanding Wróblewski's work is difficult as most of his paintings and drawings is owned by Polish museum or private collectors. With all certainty, the monumental Polish-English monograph, Avoiding Intermediary States, published in 2014 by the Andrzej Wróblewski Foundation, Culture.pl and Hatje Cantz should be of help to international audience. The book is a proposal to look at Wróblewski's oeuvre keeping his versatile activity in mind – apart from a painter, he was also an art historian, critic and commentator of art life. Author: Malgorzata Kitowska-Łysiak, Art History Institute of the Catholic University of Lublin, Faculty of Art Theory and the History of Artistic Doctrines, December 2001, updated WK Sep 2012, AS Mar 2015, transl. update NS May 2018.